RIGHT turns will be banned as part of a trial to solve traffic snarls at the notoriously clogged intersection of Beaufort and Walcott streets in Mt Lawley. 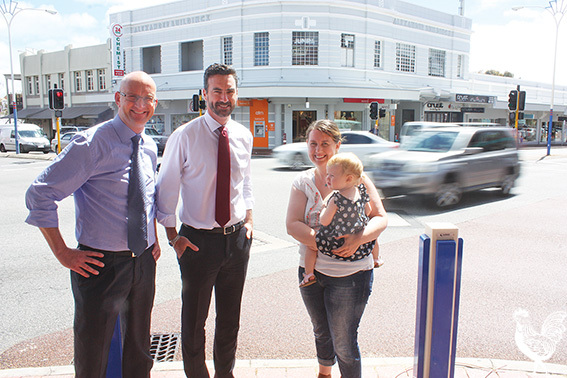 The intersection has been a bugbear for local politicians for years because Walcott Street is on the boundary of Stirling and Vincent, and while drivers and pedestrians regularly complain, the two councils couldn’t agree on a solution. But recently federal Labor member Tim Hammond got everyone in the same room to broker an agreement. “Whereas others have seen this issue as too hard, Tim has dug in, worked hard, and achieved a great result”, said Labor’s Mount Lawley candidate Simon Millman. But Liberal Mt Lawley MP Michael Sutherland thinks it’s cheeky for Labor to claim the win, when his previous efforts to get a right turn ban were stymied by Mr Hammond’s predecessor Alannah MacTiernan back when she was Vincent mayor. Mr Sutherland organised a working group of transport officials and local government representatives in 2012 who recommended a ban, but Vincent blocked the idea based on concerns about rat-runners. The intersection became such a bee in Mr Sutherland’s bonnet he referred to it as the “Berlin Wall”. “I’m absolutely aghast that Labor is claiming credit,” Mr Sutherland said. “Of course I’m happy with the outcome, but for Labor to say they’ve done it — why did they not do it for the last three years when they’ve just done nothing?” Mr Sutherland said. Local resident Jo McElvenny, who has campaigned for Mount Lawley pedestrian safety since her four-year old was a babe in arms, says she’s happy with the outcome but won’t credit one pollie. “I’m really excited by the fact that Tim Hammond seems to have made headway and that Stirling and Vincent are on the same page because its been a long time coming,” Ms McElvenny said. The no-right-turn rule will be in place for a 12 month trial, during which the side-streets will be monitored for extra traffic.